God gave Solomon wisdom and very great insight, and a breadth of understanding as measureless as the sand on the seashore. Solomon’s wisdom was greater than the wisdom of all the people of the East, and greater than all the wisdom of Egypt. He was wiser than anyone else, including Ethan the Ezrahite—wiser than Heman, Kalkol and Darda, the sons of Mahol. And his fame spread to all the surrounding nations. that grows out of walls. He also spoke about animals and birds, reptiles and fish. From all nations people came to listen to Solomon’s wisdom, sent by all the kings of the world, who had heard of his wisdom." Solomon did what Samuel had warned Israel about if they received the king they had asked for. taxes and provisions would be collected by the district’s chief officer. 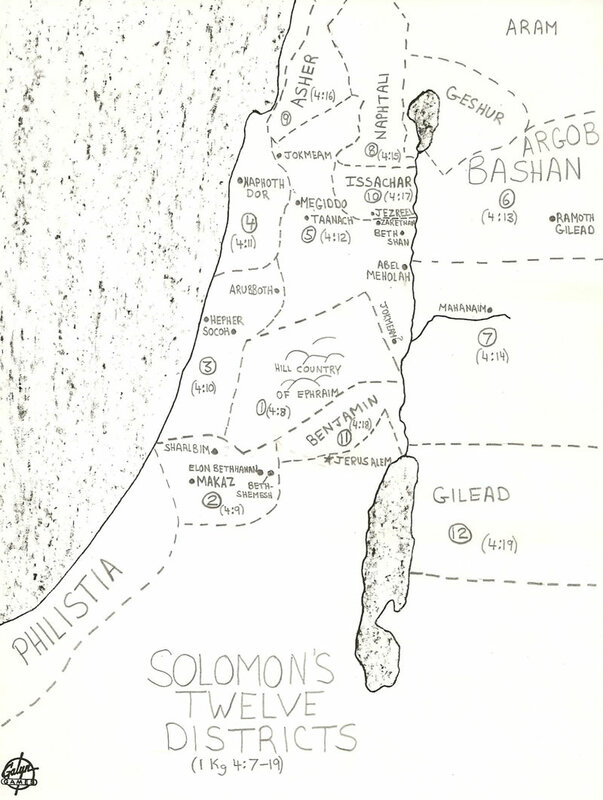 The tribe of Judah was exempt from taking their turn which, obviously, was not going to be accepted easily by the northern tribes. and sayings of wisdom from Amenemope a hundred years before Solomon are still available. Even in the Akkadian Empire (Mesopotamia) of 2300 BC wisdom was sought and recorded. Wisdom of Ahiqar which can be seen here and here. he would be listened to on i-tunes with a continual musical presence in the nation’s top forty pop songs. But, more Solomon was also a scientist speaking about the smallest plants to the largest trees with insight into zoology, also. Solomon’s talents made him more than a mere national celebrity. Solomon’s fame spread into other countries so that even kings sent their diplomats and representatives to Solomon to seek his advice concerning political and international situations. 3:1; 5:1; 2 Corinthians 5:17). God is the father of the new birth (John 1:12, 13). Christ is the power of the new birth (1 Peter 1:3). The blood of the new covenant is the starting point of the new birth (1 Peter 1:18-19). “exceeding” or “surpassing” in places such as Ephesians 2:7. Hebrews 11:37 refers to an account recorded in the ancient Hebrew book “Martyrdom and Ascension of Isaiah” that records King Manasseh of Judah sending orders to have Isaiah captured and sawn in half. society, economics and science work? than much gain with injustice." 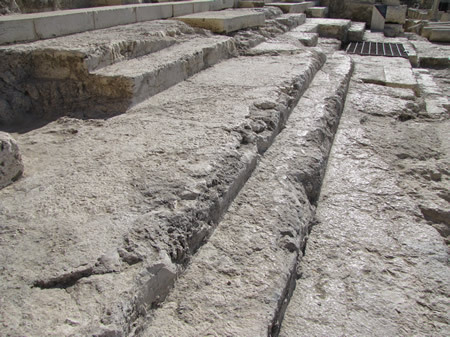 The original steps from the days of the New Testament used to access the Temple Mount from the south. These steps were designed to create a slow procession up the to the Temple Mount by alternating a wide step (long run, 35 inches) with narrow step (short run, 12 inches) as seen in this photo. This flight of stairs is 210 feet wide. The stairs are a combination of smooth stone slabs and carved bedrock. The stairs alternate between a 35 inch run(the length of the step) and a 12 inch run, except for the first and last three steps, which are all 12 inches. 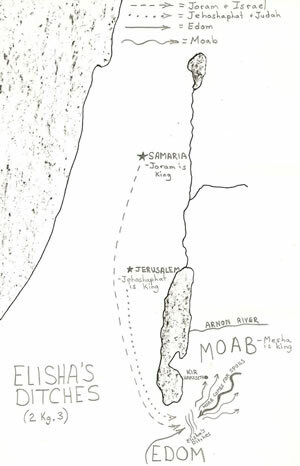 The alternating step width caused the Jewish worshippers to proceed toward the Temple Mount with a steady, unrushed pace. It happened once with Rabban Gamaliel and the elders, that they were sitting on the stairs in the Temple Mount. Details from 2 Kings 3 when Judah and Israel went to war agains Moab and Elisha had the troops dig trenches to supply the troops with water and deceive the enemy.